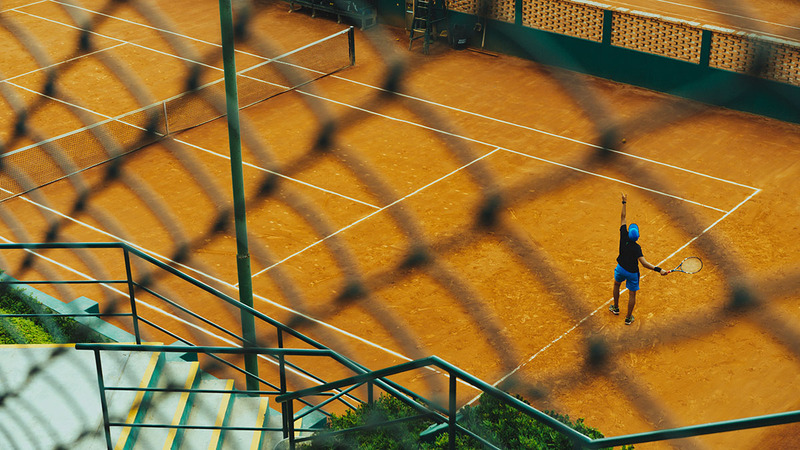 Jack groaned as he drove the last block to his local club, wondering why he’d agreed to play tennis with his friend Andre. He was feeling low because his girlfriend Serena had just broken up with him and he’d been brooding over their conversation ever since she slammed the door behind her on her way out of his flat. He wished he could just go home, turn on the TV and escape. By contrast, Andre couldn’t suppress the smile on his face as he strolled towards the tennis club without a care in the world. He was celebrating his first anniversary with his girlfriend Stephanie and was looking forward to dinner at their favourite restaurant later followed by a sci-fi movie he’d been waiting to see for ages. Jack and Andre hadn’t played tennis in a while. They were evenly matched in terms of skill and while they were both competitive, neither of them took the competition too seriously, which usually made for a good game. After parking his car and changing, Jack made his way to the court, where he found Andre joking with the two guys on the court next to theirs. After warming up, the two volleyed for service, which Andre won and they started. The games flew by quickly and within an hour, the match was over, Andre coming out on top, a comfortable 6-3 6-2 winner. The result of Jack and Andre’s friendly tennis match isn’t really much of a surprise given their contrasting emotional states. However, the story provides an interesting insight into how our emotional state affects our ability to learn, and not in the way you’d first expect. It turns out that it’s not the content of the story itself that’s of interest, but how it was used. The Jack-Andre story, which I paraphrased above was actually constructed for a scientific study on the effects of emotion on learning and memory, run by Stanford psychologists Bower, Gilligan and Monteiro in 1981. A group of 16 college students were hypnotised to induce happy or sad moods and read the Jack-Andre story through twice. The full story was around 1000 words long and was divided into around 121 idea units or simple clauses, of which 57 were about Jack, 54 were about Andre and 10 were about neither of them. The subjects answered a questionnaire immediately after they’d read the story for the second time, in which they were asked who they identified most strongly with and who had the most details associated with him amongst other things. They then returned the next day and without being hypnotised they were asked to recall everything they could about the story they’d read the day before. Almost all of the subjects who’d been induced to feel sad identified more with Jack and those who had been induced to feel happy identified with Andre in the initial questionnaire. Then, in the recall testing the next day, the sad group recalled significantly more facts about Jack and the happy group recalled more facts about Andre. Thus not only did readers tend to identify with the character that was experiencing a mood similar to theirs, they also recalled more information that was related to that character and the relevant mood. The study thus provides evidence of mood congruent memory – the idea that material relevant to a learner’s mood will receive special attention, elaboration and processing during the encoding phase of memory, which will make it easier to recall later. However, it’s important to note that the subjects were highly motivated to remember the material regardless of their state, in order to comply with the experiment. Clearly extreme moods can have an impact on motivation and attention during the learning process as any of us who’ve tried to learn after a big argument or when something particularly exciting has just happened can attest to. In a previous post I looked at how our external environment affects our ability to learn, from the place we study to the sounds, sights and smells around us. Some studies have shown evidence of an environmental reinstatement effect – the idea that returning to the same environment where something was initially learned will lead to better recall. This phenomenon has also been studied from an internal perspective by looking at whether recreating the mood and emotional state in which learning took place can affect our ability to remember what we’ve learned. In a related study by Bower, Gilligan and Monteiro in 1978 participants were tested on a set of words in different emotional states and it was found that there was a slight tendency for recall to be better when a subject was tested in the same mood that they learned the material in initially. Similar results were found in a 1974 study showed that people with bipolar disorder remembered best what they learned during manic phases when they were manic again and vice versa when they were depressed. Overall, the evidence suggests that the impact of emotional states on our memory is significant but not dominant in most cases – moods come and go, colouring our experience rather than fully defining it. Research has shown that related cues such as images or sounds have a much stronger effect than the internal cues from being in the same emotional state. Our internal environment – our mood and emotional state – undoubtedly has an impact on our ability to learn and recall information. We tend to recall what we’ve learned better if we can match the mental or emotional state we were in when we first learned it. However, these effects are far less relevant if additional contextual cues such as relevant sounds or images are provided. While it’s impossible to recreate the exact mental state you were in when you first learned something, you can get close by performing certain activities that help bring you towards it. If you’re taking an exam, it’s probably desirable to be in a calm, relaxed state of mind, so try to induce this state while you’re studying by spending a few minutes listening to a relaxing song or sitting in silence. Then do this again before the exam to try and recreate that same mental state. It’s not always easy to manipulate your mood but do what you can before a learning session to put yourself in state of mind that’s conducive to learning. If you’re really angry about something, write down what’s bothering you and promise yourself that you’ll think about it after you’ve studied – most of the time it will wear off and you’ll become deeply involved in your learning. The more contextual cues you have when trying to recall the better, so try and use as many sensory systems as possible when encoding information. You could remember the texture of the paper of the book you’re studying from, the colour of the pages and the front cover, the new book smell and the sounds going on in the room around you while studying. Each piece of sensory information can act as a mental hook from which you can re access the desired information and knowledge.